FARM TO TABLE Celebrating Stratford Chefs School Alumni, Recipes & Perth County Producers by Andrew Coppolino is a unique farm to table story, with recipes, photos, and a strong sense of place. The place is Stratford, Perth County, Ontario. You just have to look at the cover of the cookbook to catch the essence of the story. Chef’s hands holding carrots freshly pulled from the garden, tops and soil attached. Chef’s cuffs rolled back, ready to work with farm fresh-gems. The carrots held proudly in a “look-at-this” position of discovery and anticipation. A chef’s tease for an upcoming dish. 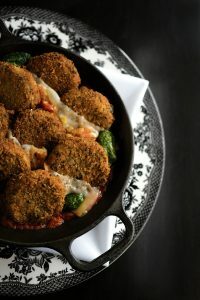 PHOTOGRAPHY Terry Manzo’s food photography is palate-popping with colour and texture, from the Red Kale and Brussels Sprouts salad to the Malanzane Parmigiana. Her candid shots includeThe Bruce Hotel Beekeeper at his hives, George Taylor’s goat munching hay at C’estBon Cheese Ltd. and Andrew Courtney crouched among rows of vegetables at A Still, Small Farm. Unlike the standard cookbook with chapter headings that provide food categories, FARM TO TABLE is about chef-producer relationships and the recipes those relationships create. The cookbook is divided into two parts: Stratford Chefs School Alumni, Recipes & Perth County Producers and Stratford Chefs School Team Members, Recipes & Perth County Producers. In each part, a chef or restaurateur is paired with a producer and a recipe is created. There are 18 pairing-relationships in total. 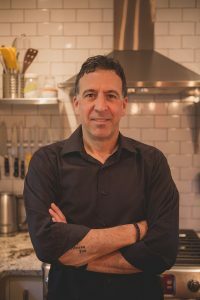 Andrew Coppolino shares the fascinating stories of how the alumni chefs and the producers arrived at this point in their careers. Through his interviews with them he transports us to their community. With his abundance of direct quotes we discover their personalities, their goals and their senses of pride. As examples, Ryan Bergman, of Loco Fields vegetable farm, describes a scenario in which he picked his vegetables at three o’clock, delivered them to a restaurant 30 minutes later and by five or six o’clock those vegetables were served to customers in the restaurant dining room. Jordan Lassaline, at Revel, tells us how the producers discuss their farming practices with the chefs. The farmers send their families and friends to the restaurants to dine. The out-of-the-ordinary, 23 recipes in the book include soup, focaccia bread, schinitzel, mac ‘n cheese, dessert, salad, sandwich, duck, vegetables, sauces, icing, and breakfast. They are not presented in a standard categorized order, nor are the measurements consistently in metric or imperial. The recipes are entered just as the alumni chefs wrote them, reflecting their individual cooking styles. The recipe methods are chatty, personal, and precise. Whether the reader is a novice or experienced cook the details of the methods are those of experienced chef-instructors who want their students to succeed. The comfortable tone draws the reader into the chefs’ kitchens. 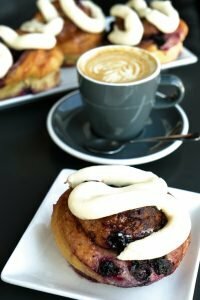 The methods reveal the amount of time and effort it takes to produce photo-perfect, full-flavoured, texturized, appealing food that diners return to again and again. Seven or eight recipes require extensive preparation. With FARM TO TABLE if you don’t choose to prepare the dish, you will know what restaurant to go to, to find it. IS FARM TO TABLE BOOKSHELF WORTHY? Absolutely. Whether a cook or not, anyone who loves food, recipes, good food photography and who appreciates the community of farm-to-table, will want this book. Though the sense of place in the stories and recipes is focussed on Stratford, Perth County, Ontario, the recipes and the farm to table movement are global. Local Perth County recipe ingredients can be replaced with fresh produce from other locales. 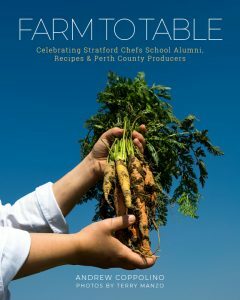 The cover, recipes, images and review copy of FARM TO TABLE, Celebrating Stratford Chefs School Alumni, Recipes & Perth County Producers were provided to the reviewers by Swan Press. This review was written by Phyllis Hinz and Lamont Mackay, The Cooking Ladies, travel writers and cookbook authors. www.thecookingladies.com. In a heavy bottomed saucepan pour in the sugar and cook over moderate heat until it is caramelized. Resist the temptation to stir the sugar or you could crystallize it; instead, gently swirl the saucepan to insure an even cooking of the caramel. Once the caramel has been achieved, carefully add the vinegar all at once, it will splutter so caution is required. The sugar at this point will clump together, using a whisk stir to dissolve the sugar into the vinegar, then add the stock. You may need to reduce the gastrique a bit (until it is thick enough to coat the back of a spoon). Reserve. If using a pressure cooker, place one tablespoon of maple syrup, the beans and the water into the pressure cooker, cook on high for 20 minutes then use the quick release to vent the pot. Drain the beans, drizzle on the remaining maple syrup, season with a little salt and reserve. For the traditional method, soak the beans overnight, drain and place them in 6 cups (1500 ml) of fresh water. Boil until tender, about one hour, then drain, drizzle with maple syrup, season with salt and reserve. Place all the ingredients into the pressure cooker and cook on high pressure for 13 minutes. Vent using the quick release method. For the traditional method add rice and 6 cups of water (1500 ml) to a saucepan. Bring to a boil and simmer for about 45 minutes, until the grains have become tender. Drain, season and reserve. Set the immersion circulator’s temperature to 136F (58C) and use it to warm a container full of water, that is large enough to hold the duck breasts, to the desired temperature. Season the duck breasts with kosher salt then place them in a re-sealable plastic bag and lower into a water bath to push the air out of the bag (or use a vacuum sealer) and then seal. Put the bag in the heated water and cook the duck for a minimum of one hour, up to four. 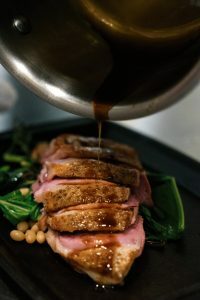 Just before serving, remove the duck from the bag, pat dry, heat a heavy bottomed skillet, that can hold all of the duck breasts without crowding them, over medium heat. Sear the skin side of the duck breasts until some of the fat has rendered and the skin has turned deep mahogany colour. For the traditional method, pre-heat an oven to 450F (230C). Season the duck breasts with salt. Place a large heavy bottomed skillet over medium heat, place the duck breasts in the skillet skin side down, and then place into the pre-heated oven. Cook until the internal temperature of the duck reaches 130F (54C) (about 10-12 minutes depending on your oven). Let the duck breasts rest for 5 minutes (the internal temperature will continue to rise). In a large sauté pan, add a tablespoon of butter, the mustard greens and pinch of salt. Sauté until just wilted. Add the beans and rice to the slightly wilted greens and warm through. Place a tidy mound of the greens mixture onto the centre of a plate. Carve the duck breast into thin slices and place over top of the greens mixture. Drizzle the gastrique around and over the duck. Serve immediately.